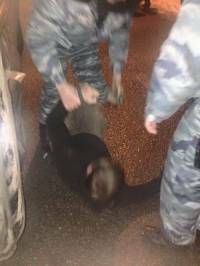 Civic and media organizations are demanding a full investigation into the incident on Thursday night when Luhansk human rights activist and correspondent for Informator.lg.ua, Kostyantyn Reulsky was beaten after he and two journalists were stopped by traffic police officers whom they believe to have been former Berkut officers. Reutsky, Anastasia Stanko from Hromadske Radio and Pawel Pieniążek from the Polish ‘Krytyka Polityczna’ were returning to Kyiv from the ATO [anti-terrorist operation] zone where they had been working for two weeks. Reutsky was driving. They were stopped at a checkpoint near the town of Pisochyn on the approach to Kharkiv by a group of police officers. The officers appear to have become aggressive when Reutsky videoed them examining the car and Reutsky was thrown to the ground and punched . The officers grabbed the video recorder that he had been using for reports about people living in areas close to military action who are constantly coming under shelling. They returned the recorder after the incident but without the memory card. The three are convinced that their assailants were police officers who during EuroMaidan were part of Berkut riot police units. Witnesses are adamant that Reutsky did nothing to provoke the attack on him. Reutsky is the head of the Postup Human Rights Centre in Luhansk and played an active role in EuroMaidan. He has been making trips to areas close to the conflict, and has ATO accreditation. He has lodged a formal complaint with the police over the incident, and the officers have been suspended pending the outcome of the enquiry. The officers claim that the journalists caused the conflict and that Reutsky ‘fell to the ground’. This is not backed up by the other journalists nor, seemingly, by the photo above. Following public outrage, the Kharkiv regional prosecutor’s office has announced that an investigation will be carried out into whether the officers exceeded their official powers (Article 365 of the Criminal Code).